The Nigeria Labour Congress (NLC) on Monday in Abuja said 30 state governors have agreed to pay N30,000 as the new national minimum wage. The union urged the National Assembly to ignore the recommendation of N27,00 by the Federal Government. NLC made the plea at a National Assembly public hearing on the bill. The union had rejected the N27, 000 proposed by the government. 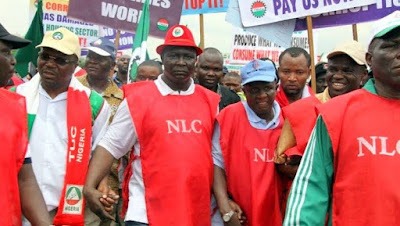 NLC president, Ayuba Wabba, told leaders and members of the National Assembly at the event that N30,000 was what NLC had canvassed for and reached a compromise on. Mr Wabba said NLC accepted the figure because it was reasonable enough to see the challenge at the negotiating table. He said NLC had discussed with 30 state governors and they had all agreed to pay the N30,000. “We have considered all factors and we are pleading with the House, governors and our leaders that N30,000 is a compromised position, that all of us will work together to build our country,’’ Mr Wabba said. However, the NLC proposed four amendments to the current minimum wage bill. The NLC president said the first amendment was about the figure. He observed that item 1 provided for a minimum wage of N27,000, pleading that the figure should be changed to N30,000. The second amendment was in section 2(b) which talked about duration of four years as contained in the draft bill. The NLC proposed that it should be a four-year cycle, bearing in mind that major economic upheaval will adversely affect the value of the new minimum wage, saying this was in tandem with global best practice. Labour also sought an amendment on the threshold, asking that it should be removed, “because we say every worker should be able to earn at least the minimum wage’’. Mr Wabba also said that those employing from 25 and below should not be exempted. He said the body charged with the responsibility of making the next review should be institutionalised. He said the tripartite body would come to the table on equal footing and if there was any need for any inclusion, the minister could make recommendations to the president after discussing with social partners. Lastly, Labour sought amendment to section 5 (a) which had to do with penalty. Mr Wabba said that the recommended penalty of N5,000 was too minimal and asked that it should be increased to a fine not exceeding N75,000.